The original CEDAR Studio and CEDAR Studio AAX numbered hundreds of high-profile studios and post houses among their users. 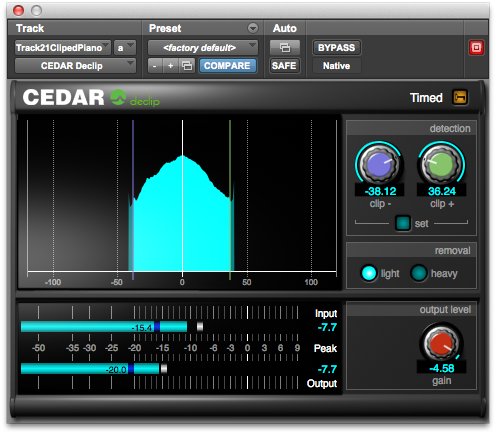 Today, CEDAR Studio 6 offers even more of the advanced processes that allow you to improve the sound quality of your audio. 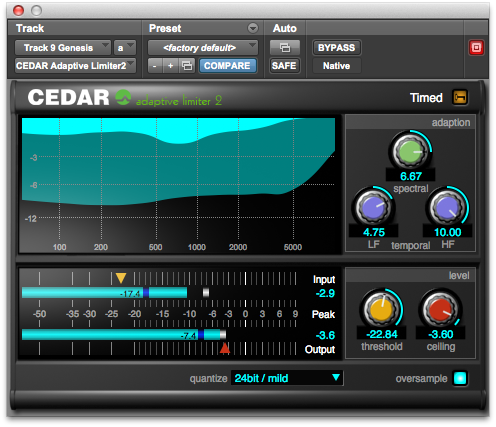 Each CEDAR Studio 6 process has been developed from our multi-award-winning CEDAR Cambridge™ flagship, and provides unsurpassed results, quickly, and with the minimum of fuss and user intervention. Adaptive Limiter 2 employs a unique algorithm that calculates a continuously varying EQ profile that constrains the output while retaining the integrity of the input. The result is a perfectly controlled signal that remains much more natural than audio processed using conventional limiters. It's also an unsurpassed maximiser and, with advanced resampling and noise shaping capabilities, it's ideal for mixing, final mastering and other creative duties. Many plug-in dehissers are prone to side-effects known as twittering and glugging. Auto Dehiss embodies a more advanced algorithm that enables the software to determine the broadband noise content and remove it without the introduction of unwanted side-effects or artefacts. A manual mode is also offered for fine-tuning the results when wanted. This powerful but simple process removes unwanted signal components across the entire audio spectrum, and is capable of removing all manner of buzzes and hums with fundamentals as high as 500Hz. Debuzz will also track wandering tones and, unlike traditional filters, can successfully restore your audio without unwanted side-effects such as limited bandwidth or the hollow sound introduced by comb filters. Declick offers better impulsive noise detection and a better interpolator than any previous declicker available for Pro Tools or as a VST. This results in superior performance across a wider range of material than ever before. Indeed, this performance is so good that, in most cases, it's not possible to hear that the signal was damaged prior to restoration. Declip allows you to identify and remove most instances of clipping in a single pass. You'll be amazed at how effortlessly it removes clipped samples and reconstructs the original signal, improving clarity, reducing or even eliminating distortion, and restoring the original dynamic range of the damaged audio. Based upon the technology that underpinned the renowned CEDAR CR-1, Decrackle boasts a remarkable ability to dig into a damaged signal to identify and remove all manner of ground-in and grungy crackle without damaging the wanted audio. It also removes many forms of buzz and some amplitude distortions from material as diverse as cylinder recordings and current broadcasts contaminated with lighting buzz. The modern standard for dialogue noise suppression in film and TV studios, on location, in newsrooms and for sporting events worldwide, DNS One offers the same Academy Award winning noise suppression as its illustrious siblings, and has rescued countless movies, TV programs and live broadcasts by suppressing rumble, hiss, whistles, babble and general background noise. DNS CS is a superb multi-mono interface that allows you to control hundreds of channels of noise suppression (any mix of DNS One software as well as DNS2000 and DNS3000 hardware) from a single host. 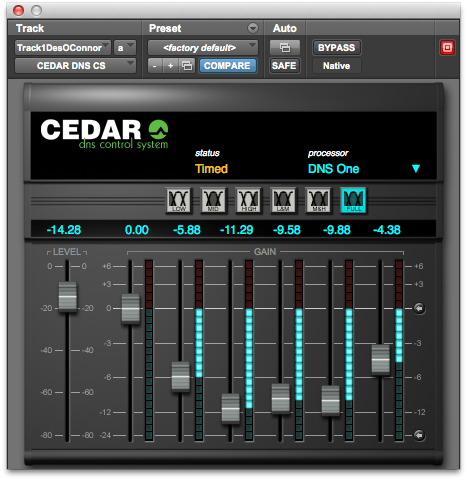 existing owners of DNS One, DNS One AAX, CEDAR Studio and CEDAR Studio AAX may upgrade existing modules to CEDAR Studio 6 free of additional charge. To be purchased at these prices, only orders received and, where no credit account exists, paid for before midnight (BST) on 30 June 2014 will be accepted. Availability is anticipated to be May 2014. For pricing information, please contact your local CEDAR office or dealer. 20 Home End, Fulbourn, Cambridge, CB21 5BS, UK.